This week’s BEACON Researchers at Work post is by University of Idaho graduate student Brice Sarver. Speciation, the set of processes through which new species arise, is one of the central areas of biological study. It is easy, relatively speaking, to come up with models of how new species could arise, but it is much more complicated to validate these theories with data from natural systems. Ideally, biologists want to develop models that 1) are supported by what we know about genetics thus far and 2) produce testable hypotheses that we can investigate using data from nature. I became interested in speciation during my undergraduate career at Washington University in St. Louis, where I designed a study program focused on integrating philosophy, philosophy of science, and evolutionary biology. This was a natural union, because speciation research draws from all of these fields. This background, combined with a collaboration in fungal systematics with Dr. Kerry O’Donnell at the USDA’s Agricultural Research Services, was my impetus for pursuing an advanced degree in biology. After graduation, I began to pursue a Ph.D. in Dr. Jack Sullivan’s lab at the University of Idaho. 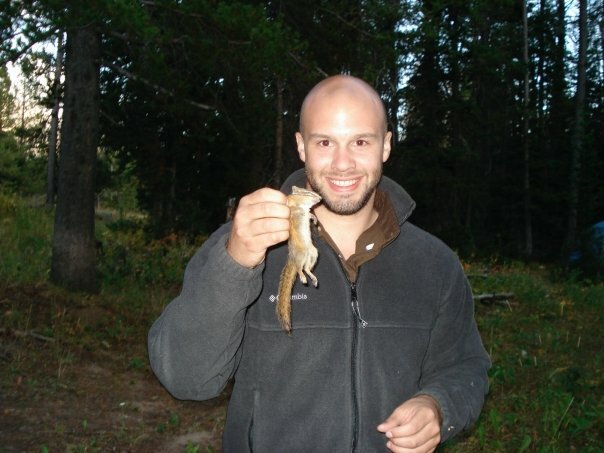 The Sullivan Lab uses chipmunks as a model system to test hypotheses related to speciation. There are 25 species of chipmunks, 23 of which are located in western North America. Chipmunk species are notoriously difficult to differentiate due to their similarity. However, some morphological characters, such as the male genital bone (baculum), have proved instrumental in telling one species apart from the next. Because of this, we can determine which species a particular chipmunk is when trapped. 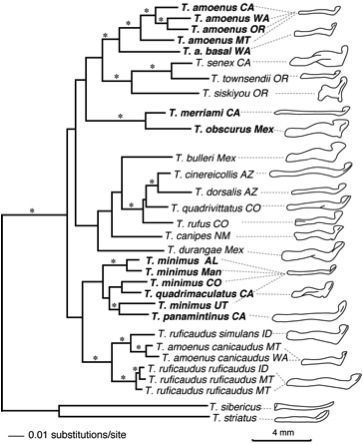 Phylogenetic estimation of the relationships among chipmunk species. To the right of each name is a representation of their baculum, the male genital bone. Two species of chipmunks were included as part of a Sullivan Lab phylogeographic survey of Pacific Northwest forests: the yellow pine chipmunk (Tamias amoenus) and the red-tailed chipmunk (Tamias ruficaudus). Analysis of a portion of their mitochondrial DNA revealed something surprising: these two species were and are exchanging mitochondrial genes, and they are doing so frequently. This phenomenon, called mitochondrial introgression, is common among hybridizing mammals. Upon further analysis, it was discovered that these two species are the second-most distantly related among the 23 in western North America. 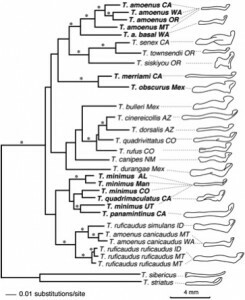 Even more interestingly, these species show a recurring pattern of asymmetrical introgression: mitochondrial DNA moves from one species (or a subspecies) into a different species (or subspecies), and not vice versa. Additional samples provided by collaborator Dr. John Demboski at the Denver Museum of Nature and Science reveal that mitochondrial introgression is rampant among chipmunks in the Southern Rocky Mountains as well. This system is composed of six species. Two of these species are isolated from others (allopatric) and do not exchange genes; the other four experience rampant introgression, though it does not appear to be asymmetric. These Southern Rocky Mountain species are also more closely related than the yellow pine and red-tailed chipmunks described above. Introductory biology students are often taught that the presence of reproductive isolation can be used to separate one species from another. Furthermore, the easiest and most often-taught way to think about new species arising is in allopatry: a population is split into two by some kind of barrier (say, a river), the two populations accumulate changes, and, ultimately, they are no longer able to produce offspring when they come back into contact. Chipmunks have many well-characterized species despite being able to interbreed, and there is still movement of genes (gene flow) between species currently. How can we reconcile these views? Ongoing work in the speciation field includes formulating “divergence with gene flow” models. These models attempt to explain diversification in the face of ongoing genetic exchange between speciating lineages; they focus on how divergence takes place across the genome. One model, originally described by Wu (2001), is useful for thinking about speciation in this light. We know from previous work dating back to the first half of the 20th century that some hybrids can perform poorly as the result of negative interactions among genes from different species (antagonistic epistasis). As genomes diverge and one species begins to form two, small regions of epistatic incompatibility can arise. As time progresses, these regions can expand to form larger regions of incompatibility that are difficult to break down. As a result, the amount of gene flow between species begins to slow down until it stops. The two species are now “good “ species in a traditional sense, unable to interbreed. An example of a divergence with gene flow model based upon Wu (2001). Examples of chipmunk species and subspecies that correspond to the four stages are to the right. In order to look at how much introgression is taking place across the entire nuclear genome, we have to use more modern genomic techniques. In collaboration with Dr. Jeffrey Good at the University of Montana, we are using targeted sequence capture techniques to determine the DNA sequence of thousands of genes across the genome in the Southern Rocky Mountains chipmunk system. One goal of this study will be to assess how divergence in the nuclear genome takes place in light of rampant mitochondrial introgression. In order to do this, we will look at thousands of single base changes in the DNA (single nucleotide polymorphisms, or SNPs) in order to track the quantity of genetic material being exchanged between species. This will also allow us to look at the kinds of genes that are able to move between species easier than others. 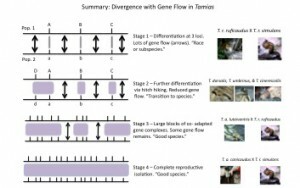 We would expect that species that are more closely related would have higher rates of gene transfer than those that are more distantly related, since the divergence with gene flow model of speciation predicts that the amount of gene flow will decrease with the time since the species split. 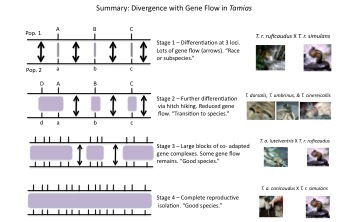 Ultimately, this project, combined with others in my dissertation, will provide empirical support or refutation for current models of divergence with gene flow and provide insight into the process of how new species form. For more information about Brice’s work, you can contact him at bsarver1337 at gmail dot com. This entry was posted in BEACON Researchers at Work and tagged BEACON Researchers at Work, Biological Evolution, chipmunks, Field Biology, phylogenetics, speciation. Bookmark the permalink.